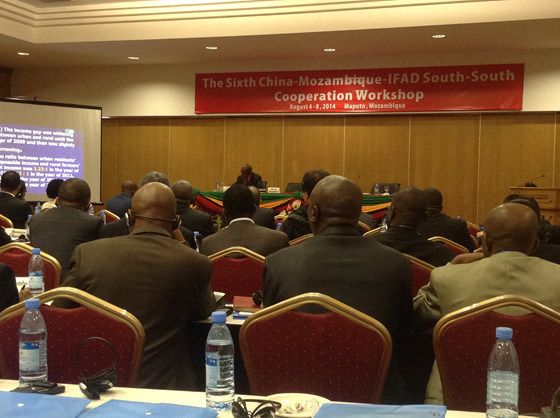 The 6th China-Mozambique-IFAD South-South Cooperation workshop held in Maputo, Mozambique on 4-8 August 2014 conference focused on three important policy reforms in China that resulted in unblocking agricultural development and the China Africa Development Fund (CADFund). The policy reforms focused on Chinese agricultural policy and impacts, agribusiness reform and mechanization, and research and development. The progress in the Chinese agricultural policy and impacts was presented by Prof Zhang Xiaoshan. Various agricultural policies reforms enabled China to put in place incentives for smallholder farmers. The aim was to increase their participation in the agricultural sector development through improved property rights. 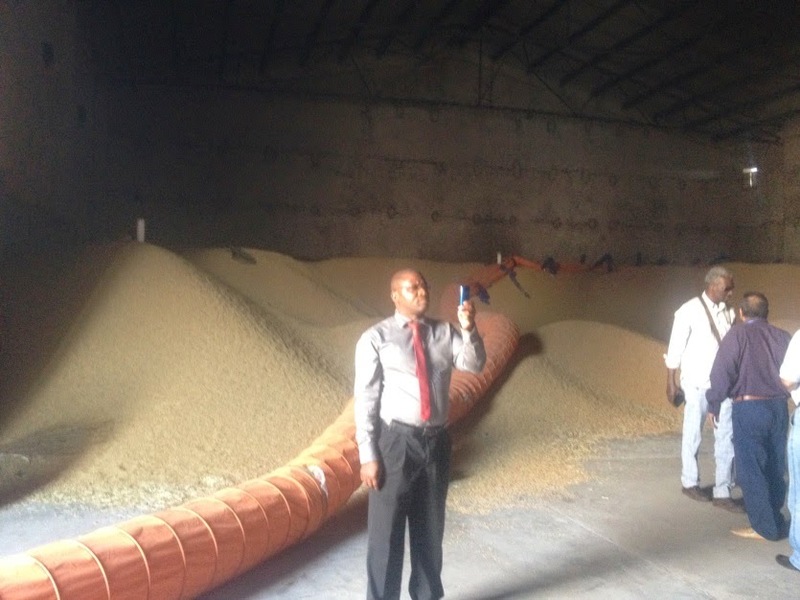 The result has been an increase in grain production and incomes for farmers. The paper elicited an interesting discussion on the similarities of the challenges faced by China and Africa in rural urban migration and small parcels of land and property rights. The other was to understand how China has managed to change but Africa has not been able to change. The policies are in place but the difference is in the implementation of these policies in Africa. The agribusiness reforms and agricultural modernization in China was presented by Prof Zhang Xiaoshan. Although there existed diversified patterns on achieving China’s agricultural modernization, the policy makers favored the development of specialized households based on family farming and regarded it as mainstream in the agricultural management system. The households were encouraged to form cooperatives or associations. This enabled farmers to enter into secondary and tertiary industry and gain added value through the marketing and processing of their primary products. The mixed and diversified agricultural production system will continue to exist in China’s agriculture these are also inter-connected with China’s urbanization and industrialization process. This will inevitably influence the reform direction of rural land tenure system and rural governance structure. The key issue during this development is how to protect the interests of small farming households and protect the scarce resources of arable land, water and protect the environment. The plenary discussion centered on the weaknesses in the cooperative model on governance and management and this remain a challenge in China as well. Investment in agricultural research and development was presented by Dr Chen Qianheng. The paper explained why the public sector is the main financier for R&D. R&D is a public good and returns take a very long time to realize. The investment in agriculture research comprises about 0.5% in China’s GDP, lower than the world’s average level (1%). In china, there are 2 million enterprises but only a few large-scale or technology-oriented enterprises are engaged in agricultural R&D. The future of agriculture technology is in the area of biotechnology, water saving technologies, agricultural mechanization and precision agriculture. In all OECD countries, modern agriculture focus mainly on high efficiency and competitiveness of agriculture, food security and increase in farmer’s incomes. The plenary discussions centered on private sector involvement in R&D; how farmers can participate in R&D and how R&D can be revamped to bolster productivity. The discussions drew on the similarities on R&D and how to make R&D relevant for the stakeholders to invest in it. The China Africa Development Fund (CADFund) was presented by Henry Liu. In 2006, at the Beijing Summit of the Forum on China-Africa Cooperation, the President Hu Jintao announced the establishment of CADFund to encourage and support Chinese enterprises to invest in Africa. It has four offices in Africa namely Johannesburg, South Africa; Lusaka, Zambia; Accra, Ghana; and Addis Ababa, Ethiopia. The Fund determines investment terms according to the industrial features, return on investment, risks, exit timing and approaches etc. of the projects. Investment term of the Fund towards a single project is mainly 5 - 8 years, and will not exceed 10 years in principle. On a single project the Fund can invest USD5-50 million. It has 78 projects worth USD2.9 billion with a specific fund for Lusophone countries; Angola, Cape Verde and Mozambique. The CADFund is supporting the Wanbao project through a loan of USD60 million from China Development bank and equity of USD58 million (49%) from CADFund and USD60 million (51%) from Wanbao Enterprise joint venture of USD200 million. The CADFund signed a memorandum of understanding with IFAD in 2007. Now they are working on the modalities to link to the IFAD operating model and develop a CADFund-IFAD partnership. The motives for China’s enterprises’ Overseas Foreign Direct Investment (OFDI) in agriculture are very complex. It cannot be attributed to a single factor motive such as land grabbing overseas. The Chinese argued that so far, only a very small part of the agricultural products grown abroad was taken to China. A large portion is sold in the local market or exported to third markets. Therefore, China’s OFDI in agriculture has little impact on guaranteeing China’s food security. Most imported agricultural products from Africa are non-food items, including cotton, hemp, silk, oilseeds and other such products. The Chinese admit that China’s firms compete with local growers and some enterprises do not have a strong awareness of environmental protection and social responsibility but this is not the whole story. It is important to note that China’s enterprises’ agricultural OFDI increased agricultural investment, employment and expanded the supply of agricultural products in the local market of the host country. In the long run, the presence of China’s firms with advanced technology will benefit competition: through the expansion of local supplies while providing cheaper technologies that can be adapted and adopted by local farmers. China’s enterprises’ agricultural OFDI is win-win for the host country and China. With the rising demand for food in China and the world, more and more Chinese enterprises will venture out. In order to eliminate anxiety about land grabbing from local farmers, Chinese companies should choose the suitable mode of agricultural OFDI. Deborah and Tang (2009) pointed out: “Any efforts by foreigners to produce on a large scale are likely to continue to be controversial. Systems of outgrowing, where farmers maintain control over their own land but have incentives to produce under contract to a central company, could be a middle ground.” Considering many host countries’ food insecurity, China’s companies can come to some agreement with the host country government on the share of land output. In order to benefit local agricultural firms more, China’s firms can set up co-operative enterprise or joint venture with local company to produce agricultural products. The discussion focused on land grabbing and environmental impact assessment citing the scale of these investments. The win-win strategy at the moment seems to favour China and needs to be revisited in terms of cross cultural issues, value addition of raw products, further technical assistance to improve governance and ownership, and more trade between China and Africa. The strategy for agricultural development in Mozambique was presented by Mr Adriano Ubisse. Mozambique has a population of 24 million. Agriculture is fundamental for food security and economic development. The focus is on increasing production and area and improving the genetics. The strategy is linked to CAADP and PRSP to create competitive and sustainable agriculture, access to markets, food security, and ensure social equality. The initiative has four pillars: (i) increasing agricultural productivity and production; (ii) access to markets for improvement; (iii) sustainable natural resource; and (iv) strengthen institutions. The implementation is focusing on three corridors; (i) Nagala corridor in the north (ii) Beira Corridor in the central and (iii) Limpopo corridor in the south. This is coupled with the technical centres in each of these areas to support the development of the corridors. The participants will visit some of these technical centres during the field visits. The IFAD Mozambique investment was presented by Mr Cândido Jaque, Directorate of Investment and Cooperation, Mozambique. IFAD began operations in Mozambique in 1983 and has provided more than US$200 million in financing for 12 programmes and projects in the country. Currently there are five on-going projects – PRONEA (supports the government's National Programme for Agricultural Extension); PROSUL (improve the climate-smart livelihoods of smallholder farmers in the Maputo and Limpopo corridors), a small EU project that focus on MDGs; ProPESCA (support to artisanal fisheries), and PROMER (supporting the Markets). The Chinese cooperation is focusing on Maize, Cotton, and Rice as well as development of the research centres. The PROMER presentation on the development of markets was done by Ms Carla Honwana. Agriculture is the main source of income in rural Mozambique. She mentioned that the project is driven by a reference committee in the various regions with representatives of public, private, civil society and farmers. The projects support (i) extension services focused on market access to advise the smallholder farmers to produce according to market demand; (ii) production and quality; (ii) adult education; iii) support to rural traders, access to financial services through savings and association groups; and iv) support market information systems which include prices, products, etc. The programme is supporting knowledge management in its parent ministry, DNPDR to ensure the Ministry has ownership of the lessons learned. The Wanbao Project was presented by Mr Armando Ussivane, Chairman of Agriculture Sector Strategic Plan (PEDSA). In Mozambique there is a total of three million hectares of irrigated land. The demand for rice is 550,000 tonnes with only 300,000 tonnes produced locally, leaving a gap of 250,000 tones to meet. This led to the development of the Wanbao project or PEDSA. It has three objectives namely: (i) increase production and productivity; (ii) access to markets; and (iii) sustainable national resource management. In 2007 there was a twinning arrangement with China for technological transfer, and value addition in storage and processing. Before the project, the main problems have been (i) poor land preparation; (ii) use of low branching variety of rice (yield 6 tonnes/ha); (iii) direct planning which uses a lot of seed; and (iv) poor control of water. The technological transfer will address these problems by (i) focusing on land levelling; (ii) use of high branching variety (12 tonnes/ha); (iii) use of pre-germinated seed when planting (35kg/ha) and (iv) regular control of water. The lower Limpopo irrigation project is worth USD250 million with irrigation infrastructure costing USD113 million. The approach is a private public producer partnerships arrangement targeting direct support to small-scale farmers and partial support (50% start-up) to emergent farmers who own 5-10 hectares. The project is on course to achieving the target set on the irrigated area; at the moment it has achieved 8,000ha. There was a number of cross cultural issues and adjustments (Chinese and Mozambican) that needed to be addressed for the project to remain on course. Government should encourage private sector involvement in the agricultural sector through enabling policies to encourage them into the sector. Understand and improve the quality of agricultural products to meet the requirements for the Chinese markets. The importance of the south-south cooperation to IFAD was explained in the presentation of the scaling up agenda by Mr Cheik Sourang, Strategy and Knowledge Management. This presentation showed south-south triangular cooperation as an entry point for improved efficiency and impact at scale in agriculture and rural development. He mentioned the pathways, drivers and spaces for scaling up. He emphasized on the need for more systematic and proactive approaches, in order to reap the benefits of scale through learning, replication and partnerships. A learning event on the south-south and triangular cooperation will be hosted by IFAD on 12 September 2014 in Rome, Italy.